I know it’s recommended to place it within a non-gripping surface free of many veins/nerves. However, as a long time practitioner of MMA, almost every surface of my arms it either a striking surface or a surface that will receive strikes. The less likely a surface to be struck during sparring, etc, the less convenient it will be to present the Flex to a relevant peripheral/reader. I can always wear wrist guards that could dampen the impact, but I am not very keen on having a sensitive device receive moderate amounts of force on a regular basis, protected by gear or otherwise. have you filled out the vivokey flex beta application? 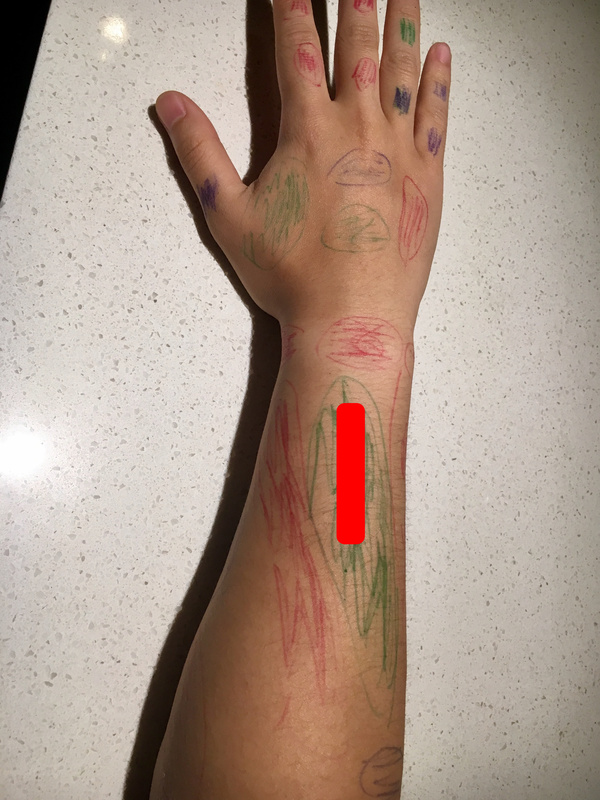 can you take photos of your hands (from the top and also supinated) and mark on them the top 2 least likely areas to be struck or used for striking, and the top 2 most likely places? I’m really looking for a heat-map for impact. if you’re willing, i think it would be interesting to place a VivoKey Flex or flexNT for the specific purpose of testing impact resilience. if you agree, we can support you on this project in several ways… PMs to follow. Why not do the ring finger? Punching properly it shouldn’t get that much force, the first two fingers ‘should’ take most of it, and if you’re competing the gloves ought to spread the impact out enough to prevent damage. I’ve attached two images to the bottom of this reply. I decided to take your heatmap idea literally and let my inner 5-year-old out. As one could probably guess, impacts are most likely near the knuckles, elbows, and where the ulna and radius protrude near the surface. I am… partially willing. I think it would be great to test impact resilience and gather data for this kind of thing. At the same time, I think I’d be more reluctant to stress test something that would require additional removal and re-implantation operations in order to replace. But I’m all ears to what you have in mind! Feel free to shoot me an email or contact me via which ever means most convenient to you. I was heavily considering the ring finger, for the exact reasons you described. Unfortunately, “punching properly” is a luxury often lost with stress and exhaustion. I also train frequently without competition gloves, often opting for lighter bag gloves, resorting to only hands wraps, or forgoing any covering at all. Of course, I can also change my training post-operation, forcing myself to always wear proper gear. Even though it’s in a green zone, I’m sure it will get banged up well enough… and I’m also sure the skin around it will be pulled and stretched regardless of being in the green zone.